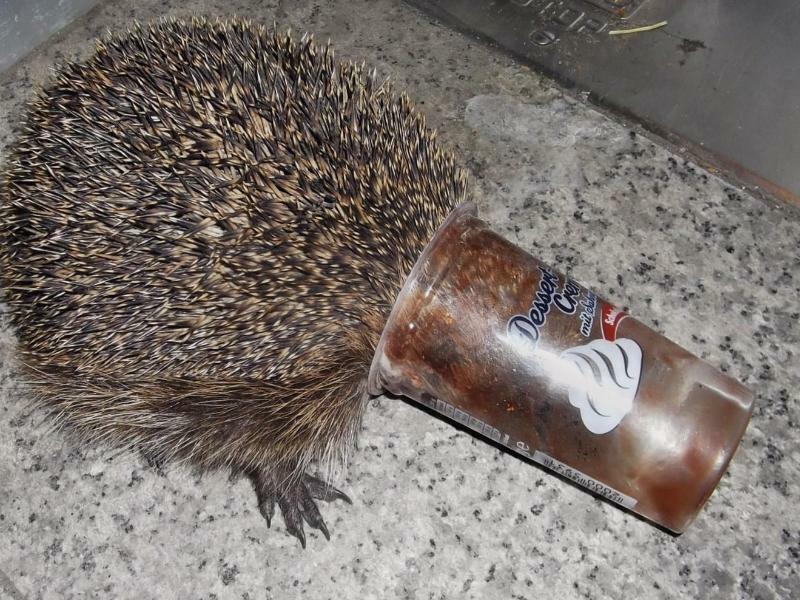 Hedgehog (Igel) found by police in Saarbrücken, Germany, testing a crash helmet made from a discarded desert container (Pudding Becher) while crossing a dangerous road. Like me I am sure many of my readers will be horrified by the all-too-frequent sight on our roads of dead hedgehogs. These poor animals, like many of us who move relatively slowly, require a little more time to cross the road. Sadly motorists do not take this into account and mercilessly slaughter them with their speeding vehicles. Considering the lack of sensitivity we humans are showing to our fellow creatures and the environment we share with them it is hardly surprising that nature is starting to respond. Germany is a country, well known for its engineering skills and therefore it is hardly surprising that the wild animals in this country have also benefited from living in this high-tech innovative environment. In the last few days the Police in Saarbrücken-Burbach uncovered a development that has shaken the German Autobahn users to the core. The Animals are fighting back! It would appear that the hedgehogs are trying to determine the benefits of different kinds of discarded food containers. On the one hand they have to fit well – the animal in the photo (Helmut) needed some help in removing his piece of Personal Protective Equipment (or PPE as we in the trade refer to it). In addition they need to be pretty robust to help the animals withstand collisions. Brightly coloured (preferably fluorescent) food containers are most preferred because they make the animals more visible, especially at night – a kind of high-vis head gear – and they attract motorists’ attention. Even those who might aim to kill a hedgehog will think twice about hitting a pudding container trying to cross the road. Very importantly the hedgehogs prefer food containers which also have some remaining food residue in them. This can prove particularly useful on long journeys in case they get hungry on the road. The example in the photo appeared to be using a chocolate pudding container – one of the most preferred crash helmets currently undergoing trials with the Saarbrücken hedgehog community. German reading visitors can find a local summary of this news in the Muenstersche Zeitung using the link here. Clearly this should be a wake up call for mankind. Do not underestimate our spiky friends – if we do not pay more attention to them and drive more carefully they may not simply stop at defensive protection measures. We could find hedgehogs and tortoises going on the offensive. It would not take a huge leap of imagination to go from inventing home made crash helmets to developing catapults or slingshots. All they would need would be some discarded knicker elastic – perhaps from the same ladies who no longer have use for the intimate toys that the cod have now started to clean up. If you like this kind of news there are plenty more exciting articles on my Alpine Press contents page which you can find here. Why not add this site to your browser favourites or subscribe to get regular updates? If you enjoyed reading how Helmut the Hedgehog (Igel) was found by police in Saarbrücken, Germany testing his crash helmet made from a discarded plastic desert pot (Pudding Becher) while crossing a German Autobahn please visit http://www.chrisduggleby.com again.